Two incidents during the war against Iraq illustrate why Japan must annul the Japan-U.S. Security Treaty and withdraw our Self-Defense Forces (SDF) support of American troops in Iraq. An innocent Japanese civilian, Mr. Shosei Koda, was recently kidnapped and murdered by Al Qaeda ally Abu Musab al-Zarqawi's militant group following Prime Minister Junichiro Koizumi's refusal of terrorist demands that Japanese SDF, our de facto military, withdraw from Iraq within 48 hours. It is without a doubt that Mr. Koda is a victim of terrorism, which we should not tolerate. However, it is important to note that the terrorists killed Mr. Koda for Jihad in the name of God. Japan is no longer involved in a war based on either political or economic ideology, but in a war based on religion. Japan's deployment of SDF in support of President George W. Bush, and therefore its position as an American ally, has made it a high-profile target for terrorists operating under Jihad. Prime Minister Koizumi's blind loyalty to President Bush is not only illegal by Japanese law, but also jeopardizes the safety of Japanese citizens around the world. Sending SDF to Iraq violates Article 9 of the Constitution of Japan, that declares "Aspiring sincerely to an international peace based on justice and order, the Japanese people forever renounce war as a sovereign right of the nation and the threat of use of force as means of settling international disputes. Prime Minister Koizumi has desperately shown his loyalty to President Bush without analyzing and anticipating the consequences of his actions. These consequences on Japanese citizens in Iraq and around the world include vulnerability to hostage-taking, torture, mutilation, cruel treatment, humiliation and execution, all of which are prohibited under Article 3 of General Provision of the Fourth Geneva Convention of 1949. A chronological review of major events on October 27, 2004, shows that the terrorist demands were refused without hesitation by the Japanese government, calling into question how much effort was truly expanded to save Mr. Koda's life. The video of the Japanese hostage was released at 2:07 a.m., and within just 5 hours Prime Minister Koizumi directed Chief Cabinet Secretary, Hiroyuki Hosoda, to refuse the terrorist demands, which he did, at 7:25 a.m.. At 8:45 a.m., Vice Minister for Foreign Affairs, Yukio Takeuchi, contacted Mr. Howard H. Baker, Jr., U.S. Ambassador to Japan, to inform him of the government's decision not to withdraw SDF. Prime Minister Koizumi publicly announced the refusal of the demands at 10:00 a.m., before the identity of the hostage was released at 11:25 a.m.. It is important to note that the highest-ranked bureaucrat at The Ministry of Foreign Affairs (MOFA), not the Prime Minister or the Foreign Minister, contacted the U.S. Ambassador, attesting to the power of bureaucrats over ministers. Ambassador Baker expressed his support for the Japanese government's rejection of the terrorist demands. This sequence of events demonstrates Japan's psychological need to seek approval from the United States in the formulation of its policy. Japanese governments have been pro-U.S. since the end of WWII, as if Japan were a subservient child fearful of punishment from a stringent parent. Since the traumatic unconditional surrender to the U.S. in 1945, Japan has, in essence, yielded its sovereignty to the United States, even after sovereignty was restored in 1952. The Japan-U.S. Security Treaty, which also took effect in 1952, has allowed Japanese governments to successfully create an illusion among the Japanese people that the U.S. will protect Japan from any military threats. The bilateral relationship between Japan and the U.S. can be considered analogous to a psychologically abnormal parent-child relationship in which an anxious child seeks conditional love and protection from its parent by being submissive and obedient in order to please the parent. 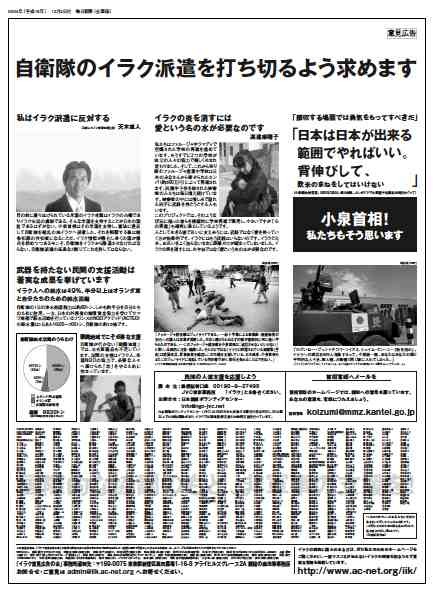 With the approval and support of the U.S. government, Prime Minister Koizumi, without hesitation, put the life of a Japanese citizen into the hands of terrorists, which by itself violates Article 13 of the Constitution of Japan that states, "All of the people shall be respected as individuals. Their right to life, liberty, and the pursuit of happiness shall, to the extent that it does not interfere with the public welfare, be the supreme consideration in legislation and in other governmental affairs. One question remains unanswered: Why did Prime Minister Koizumi, the puppet for powerful bureaucrats who actually control all three of the executive, judicial and legislative branches of a so-called "Democratic government," refuse the terrorist demands so hastily? The Japanese bureaucrats and policy makers have successfully manipulated both domestic and international media in order to avoid any possible criticism by questioning, and indirectly blaming, Mr. Koda's entry into Baghdad. From the earliest phase of this incident, the government intentionally created an image of Mr. Koda as a naive and careless explorer of the world without any particular purposes. Who would ever go to such a dangerous place without a purpose despite warnings by The Ministry of Foreign Affairs and people in Jordan? Mr. Koda's family has stated that this warm-hearted young man entered Baghdad with a strong determination to work for the people of Iraq based on his belief in Christianity, as he has done much volunteer work to help people. Protecting political and bureaucratic systems has been the top priority for Japanese bureaucrats and policy makers, a priority which supercedes the life of a Japanese citizen. Regardless of Mr. Koda's safety, Japanese bureaucrats and policy makers first made sure that they would be safe no matter what happened to Mr. Koda. It is evident that the powerful MOFA bureaucrats would escape accusation simply by replacing some ministers superficially in charge, including Koizumi, another puppet Prime Minister, and Nobutaka Machimura, a newly-appointed inexperienced Foreign Minister, if MOFA were ever criticized for the death of Mr. Koda. Prime Minister Koizumi made a statement, written by MOFA bureaucrats, that "Mr. Shosei Koda has fallen victim of terrorism, despite all possible efforts taken by the Government of Japan to secure his release from his captors." MOFA strongly defends itself by arguing that it had issued strict travel warnings. However, MOFA, without evidence, stated that Mr. Koda had intentionally ignored these warnings, a politically convenient excuse to criticize Mr. Koda. Although the Japanese government and MOFA have denied it, the terrorists claim that millions of dollars in ransom were offered by the Japanese government through an unknown third nation. With no intelligence or proper crisis management ability in terrorism, the government could not even negotiate for the release of the hostage. Knowledge of the principles of Jihad on the part of Japanese bureaucrats and policy makers must be put into question, because under Jihad, an offer of ransom would have been considered an insult to the terrorists. Mr. Koda is, thus, a victim of bungling by Japanese bureaucrats and policy makers. Why did not Prime Minister Koizumi take an initiative to send SDF to rescue our fellow citizen, which would have represented true statesmanship? The Japanese government and MOFA merely cried for help to the U.S.. The U.S. government and military were unlikely to take any action to rescue Mr. Koda, because putting the lives of Americans into extreme danger might cripple President Bush in the middle of a presidential campaign. In a second incident, two Japanese diplomats and an Iraqi driver, who were heading for Tikrit for a conference, were murdered about 30 km south of Tikrit on November 29, 2003. Saddam Hussein was born in Tikrit and had a tight network of family and clan ties there. In October 2003, the U.S. government had intelligence indicating that Saddam Hussein was hiding in Tikrit, and must have conducted an intensive search. Saddam Hussein was arrested at a farmhouse about 15 km south of Tikrit on December 13, 2003 by the U.S. military. Hussein's forces must have been fully prepared to attack any invaders. To what extent was the Japanese government informed by the U.S. government of the U.S. military operations surrounding Tikrit? If the Japanese government and MOFA had had knowledge of this intelligence, travel by the two diplomats to Tikrit would have been considered a suicidal mission. It is highly unlikely that protective and cautious bureaucrats at MOFA would have sent the two diplomats to such a dangerous zone. This may indicate that the Japanese government was not in possession of this intelligence, and that the U.S. government had not provided the Japanese government with this critical intelligence. The withholding of critical intelligence on the part of the U.S. government is against the Japan-U.S. Security Treaty. Instead of placing an official complaint to the U.S. government, which would represent an act of disobedience toward the parent on the part of the child, the Japanese government awarded a two-rank promotion to the deceased diplomats and promised that MOFA would forever protect and look after the families left behind. Because one-rank promotions are customary for individuals killed in the line of duty, the two-rank promotions appeared odd, as if MOFA were desperately trying to hide its guilt and shame for its lack of diplomatic skills. Prime Minister Koizumi and the former Foreign Minister, Yoriko Kawaguchi, as well as the highly ranked bureaucrats at MOFA, must disclose whether or not they were in possession of intelligence regarding the American military operations. If they knew about the planned operations, they should be interrogated under the criminal law for dispatching the diplomats into dangerous territory. If they did not know of the intelligence, the Japanese government should immediately annul the Japan-U.S. Security Treaty and withdraw SDF support of American troops. It is time for the Japanese people to admit that they have lived in an illusion of sovereignty and been instead manipulated by their "parent" nation, the U.S.. The first step the people can take is to demand that the Japanese government annul the Japan-U.S. Security Treaty. We must admit the reality that the U.S. government will never protect the people and the land of Japan by putting Americans into danger. The people must also put bureaucrats and policy makers under oath in order to disclose the truth regarding their actions for these two tragic incidents on behalf of the Japanese citizens. That Japan blindly followed President Bush's request to be an ally of the United States in the war against Iraq has made Japan a legitimate enemy and target of the terrorists. Furthermore, Japan's involvement as an American ally was based on questionable pre-war intelligence in the assessment of the Iraq - Al Qaeda relationship. Japan's bureaucrats and policy makers should realize that they have put Japan and the Japanese people into extreme danger. Tokyo may easily be the next target of a terrorist attack.